"Flower: Realistic to Graphic." Does that sound like a good title for a workshop in how to do this? 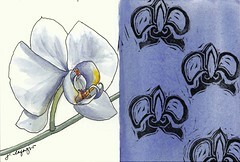 The orchid proved to be quite difficult. I carved the stamp 3 times before I was happy with this one. Watercolor and hand-carved stamp on 5x7 watercolor paper. Here's the ones I've done so far.